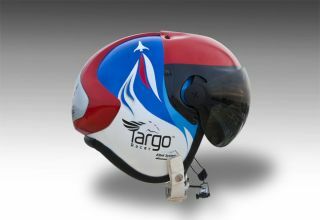 The Targo Racer helmet will show a view of the Rocket Racing League's 3-D racecourse in the sky. Pilotsin a planned race among rocket-powered jets will steer along a virtual track inthe sky by viewing the course through new custom-made helmets. Thehelmets will be debuted during an upcoming exhibition flight for thecompetition, called the RocketRacing League (RRL). The demonstration is planned for April 24 at QuikTripAir & Rocket Racing Show in Tulsa, Okla.
Insidethe visors, a display shows the 3-D virtual racecourse that pilots mustnavigate. Theleague partnered with Elbit Systems Ltd, an Israel-based defense electronicscompany, to create the helmet display, dubbed the Targo Racer. Thetechnology delivers raceway geometry, altitude, speed, gravitational pull andother important parameters directly in front of the aviator's eyes, and adjustsin real time. "Withmore than 2,500 pounds of thrust, RRL pilots go from zero to full throttle in afraction of a second and wheels-up in four seconds ? think NASCAR or FormulaOneracing in the sky," said RRL co-founder Peter Diamandis. "The TargoRacer's state of the art capabilities give our pilots, which are some of themost skilled in the world, the advanced avionics they need to deliver the mostdramatic performance for our fans and sponsors." TheTargo Racer will allow spectators and fans to view the racing action live andin real-time on large projection screens, or remotely, via television or computer. Additionalremote and rocket-mounted cameras will give fans the further sensation ofnavigating the course alongside RRL pilots. Foundedin 2005, the Rocket Racing League envisions closed-circuit and drag-style racespitting two to 10 rocket-poweredaircraft, nicknamed X-racers, against each other ona 3-D raceway in the sky. "X-Racervehicles provide a high profile platform to demonstrate our unique HelmetMounted Avionics technology in an environment where pilots are navigating theirway through a virtual raceway-in-the-sky in head-to-head competitions,"said Yoram Shmuely, Executive Vice President and Co-General Manager of ElbitSystems' Aerospace Division. "We are collaboratively pushing the envelopein aerospace and avionics technology."